Joining multiple disparate data-sources, commonly dubbed Master Data Management (MDM), is usually not a fun exercise. I would like to show you how to use a graph database (Neo4j) and an interesting dataset (developer-oriented collaboration sites) to make MDM an enjoyable experience. This approach will allow you to quickly and sensibly merge data from different sources into a consistent picture and query across the data efficiently to answer your most pressing questions. 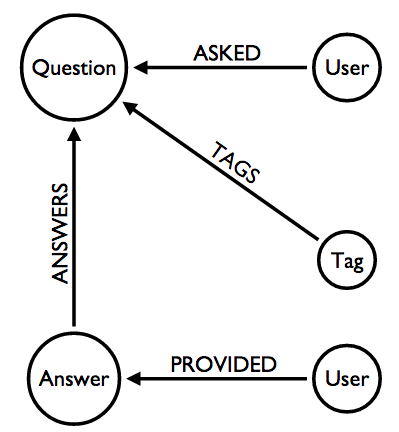 To start I’ll just be importing one data source: StackOverflow questions tagged with neo4j and their answers. In future blog posts I will discuss how to integrate other data sources into a single graph database to provide a richer view of the world of Neo4j developers’ online social interactions. I’ve created a GraphGist to explore questions about the imported data, but in this post I’d like to briefly discuss the process of getting data from StackOverflow into Neo4j. Modeling the StackOverflow data was mostly straightforward. I decided to stick with questions, answers, tags, and users for now. If I wanted to get more complex I could have included comments and edits, but a lot can be shown without them. Also, at first I had prefixed all labels with StackOverflow (so that for example question nodes had the label StackOverflowQuestion). This was an attempt to avoid conflict with later imports where I might want to use the same label (User is a prime example). After some feedback, though, I gave all nodes a StackOverflow label in addition to their specific labels. This is a simple but powerful way to model different data sources. I decided to try out Clojure (GitHub repo) to further the demonstration of using Neo4j as a central location for collecting and analyzing different sources of data together. Using my script I was able to import all 6,571 neo4j questions along with associated tags, answers, and users. The code may be easy to read for those used to a programming language that is like lego made out of lego or wearing your underwear on the outside, but for everybody else I’ll explain it. The main import functions are import-question, import-tag, import-answer, and import-user which are responsible for defining the properties to import and for calling other import- functions to MERGE dependent relationships. All of that is then wrapped in a loop to import pages of questions until the API returns false for has_more. To speed up processing I considered taking advantage of Clojure’s natural ability to execute in parallel as well as using Neo4j’s transactional endpoints to batch cypher statements. However, since all of the questions imported within about 20 minutes I’m happy for now. This post was just an introduction to the idea of Master Data Management in Neo4j. In the next post I’ll bring in another data source, show how I linked the data together, and demonstrate the sort of bigger picture that one can get from this approach.